Amusingly, Big Sushi is probably one of the most “romantic” sushi restaurants along the “Sushi Strip” (Bloor between Spadina and Bathurst). Compared to most of the other restaurants, the cozy booth-lined back section and soothing music feel positively ambient. I was not on a date, but I felt like I was. Unfortunately, the food was just not keeping pace with some of my other go-to places, like Sushi on Bloor and New Gen. My avocado/sweet potato roll ($4.50) had cold, meager rice and the sweet potato was strangely crunchy . My crispy salmon roll $(6.00) had fatty salmon and the crispy topping was sort of dry and blah. Unlike other places, there was no complimentary miso soup, salad, or ice cream. With other options in the area, I wouldn’t return to Big Sushi (unless maybe I wanted to seduce someone and New Gen was too noisy). 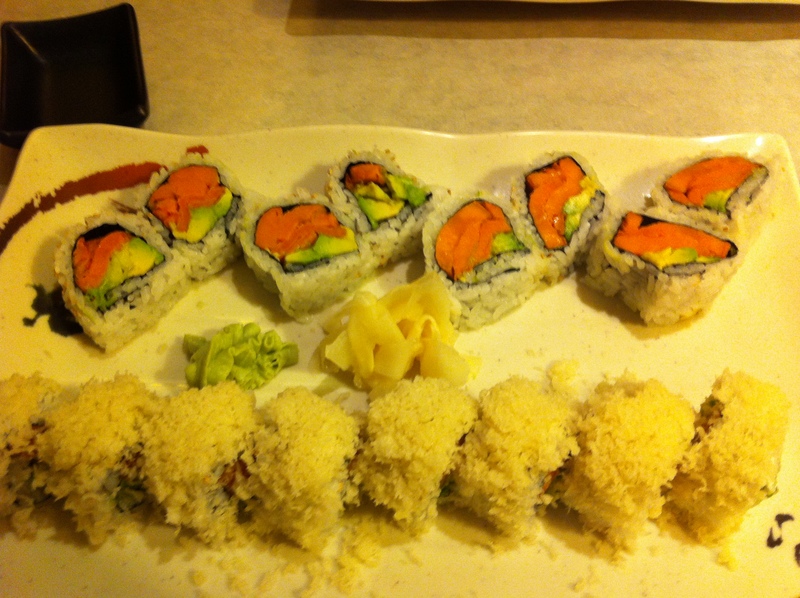 This entry was posted in Dine Under $50, Japanese and tagged maki, sashimi, sushi. Bookmark the permalink.